"Space's Deepest Secrets," premiering Tuesday (April 26) on the Science Channel, will spotlight researchers probing different mysteries of outer space. 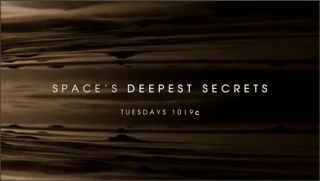 Starting Tuesday (April 26), the new six-episode Science Channel series "Space's Deepest Secrets" will follow scientists unlocking intriguing mysteries of outer space. After a two-hour premiere April 26 at 9 p.m. EDT ( 8 p.m. CDT) on the Science Channel, the episodes will air weekly on Tuesday nights at 10 p.m. EDT (9 p.m. CDT), each following researchers designing missions to understand the physics of space and glimpse the solar system's secrets. A new promo trailer hints at the scientists pushing the boundaries of human exploration. The series will spotlight scientists working on unraveling dark energy; forecasting how the solar system will end and what humans can do to survive; the past and present oceans of Europa, Jupiter and Mars; the Voyager probe speeding far away from Earth; and a secret project to "counter the force of gravity," the Science Channel said in a statement. "Viewers will experience awe and wonder as they step into the center of mysteries in space, unlocked and revealed first hand by those who engineered and executed each mission," Mark Etkind, Science Channel's general manager, said in the statement.